Made in Japan by Canon Camera Co., about 1968. Display - 13 digits, "light-pipe" display modules. Note that three are not working in the photograph above. 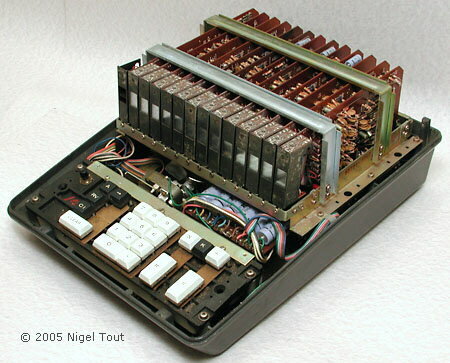 Technology - The 13 logic boards hold a total of 545 Germanium transistors of types 2SA538 and 2SB77, made by Hitachi, and hundreds of Germanium diodes. Size - 340 x 435 x 195 mm (13.5" x 17" x 7.75"), 11.4 Kg (25 lbs). 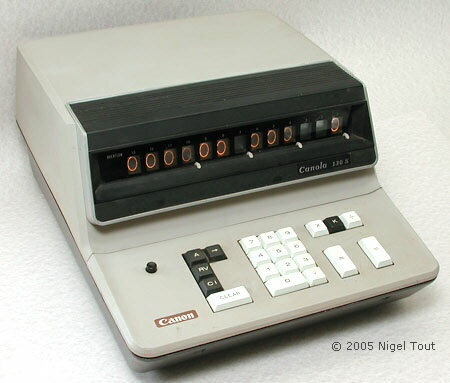 The Canon Canola 130S was a development of Canon's first electronic calculator the Canola 130 which was introduced in 1964. In 1968 it was advertised as a "compact" calculator selling for US$995 (about £400GBP). In the early 1960s the Canon Camera Company foresaw that business machines offered it an area with large growth potential. 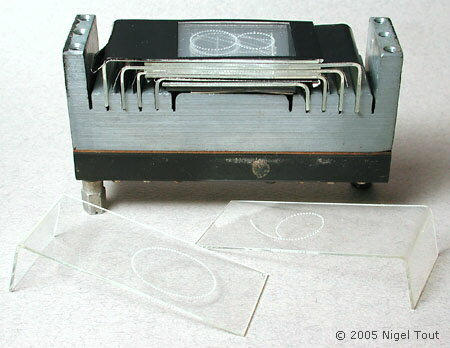 The company also had a great need for calculators for use by its lens designers, and so as part of its expansion it developed its own range of electronic calculators. One problem that the calculator designers of the period had was in the choice of display technology. 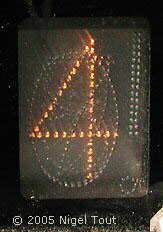 The only elctronic type then available was the "Nixie"-type numerical display tube which required high voltage drives. The Canon designers chose the much less commonly used low-voltage filament-lamp/"light-pipe" numerical modules, as described below. 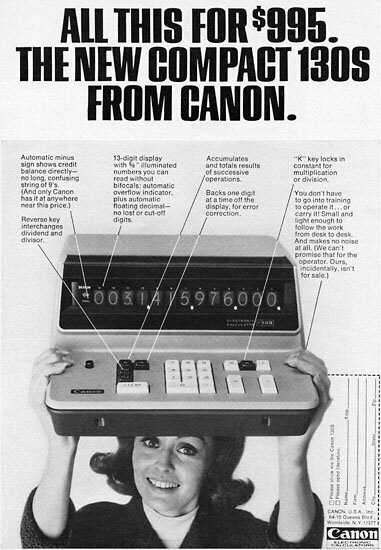 A 1968 advertisement for the Canon Canola 130S, a "compact" calculator selling for US$995 (about £400GBP). According to the U.S. Inflation Calculator the equivalent cost in 2014 would be about US$6,700! 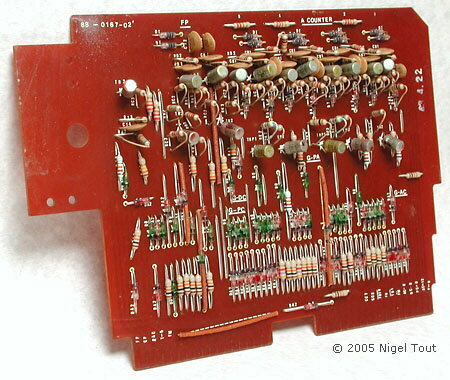 With the cover removed showing the 13 "light-pipe" display modules, which are mounted on the edges of some of the circuit boards (see below). The display and keyboard. The "->" key moves the displayed number 1 digit to the right, dropping the rightmost digit, and is used for correcting an incorrectly entered digit and for rounding a number. An unusual feature in a desktop calculator is the cooling fan, mounted below the display. 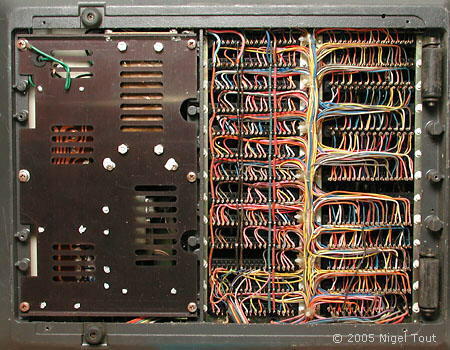 The 13 "light-pipe" display modules, with, on the far left, an additional module with warning lamps for indicating negative numbers and errors. 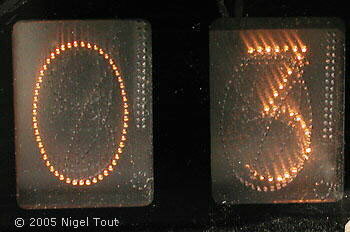 Different numbers being displayed by the "light-pipe" display modules. The method of operation is explained at the bottom of this page. 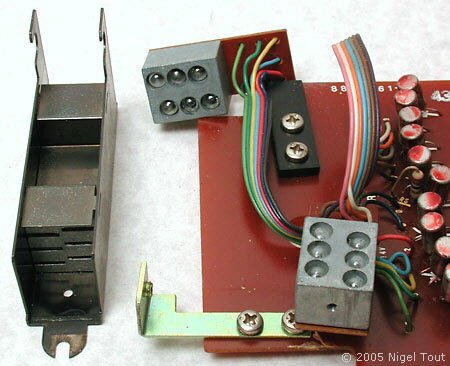 The 13 single-sided circuit boads are securely clamped into their sockets. 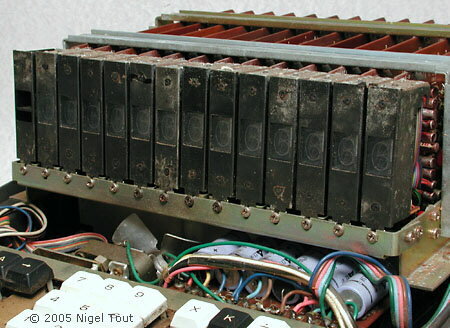 The bottom cover has been removed to reveal the very neat wire-wrapped connections to the sockets that the cicuit boards plug into. 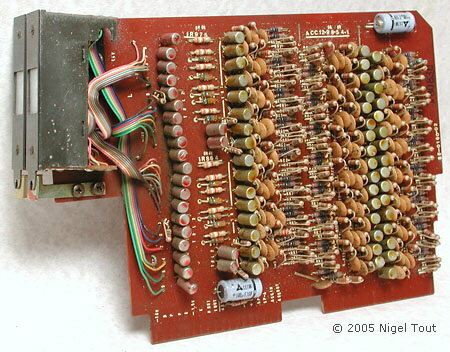 Modern practice would use a circuit board backplane rather than hand wiring. 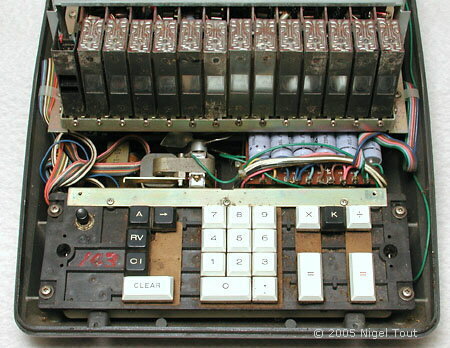 Note the wheels at the rear, far right, which were common on the heavy desktop calculators of this period, to help in moving them on a desktop. The boards alternate between those having two display modules and those without any. The two end boards each have one display module. 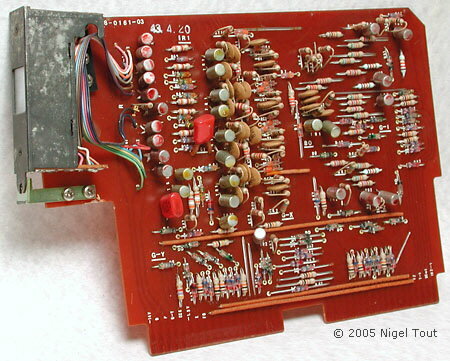 One of the circuit boards that has two display modules. 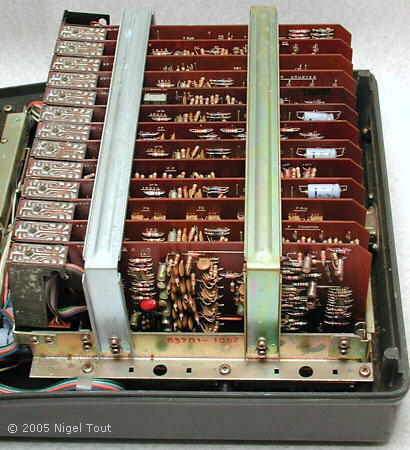 All of the circuit boards are single-sided and this one has 72 Germanium transistors (in the metal cans), diodes, and resistors. In between the boards with the two display modules are boards which have no display modules, such as this one marked "A Counter". At each end of the rack the board carries just a single display module, like this one. 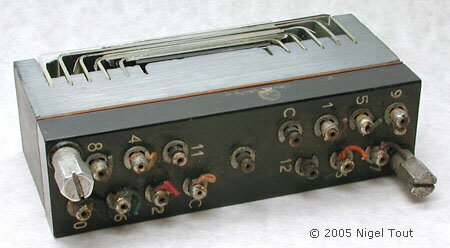 The board is stamped 43.4.20 at top left, which is believed to be a date stamp referring to the Japanese year "Showa 43" (which was 1968). 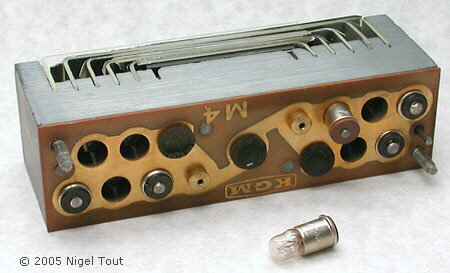 Here a light-pipe display module has been removed from the circuit board and the filament lamp assemblies have been unscrewed. 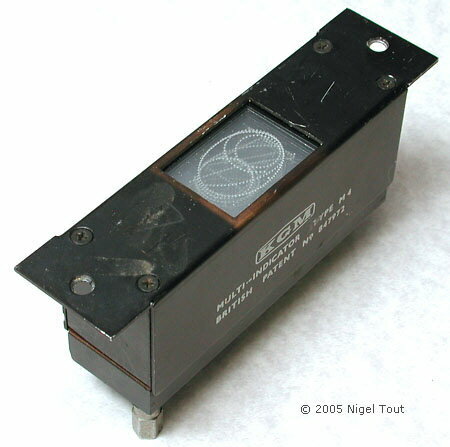 The light-pipe display partially disassembled. The plastic plate with "0" marked in conical pits has been removed from the stack of plates with the other numbers on them. Each filament lamp is able to illuminate one of the number plates. This is shown more clearly below using a larger type of display module. 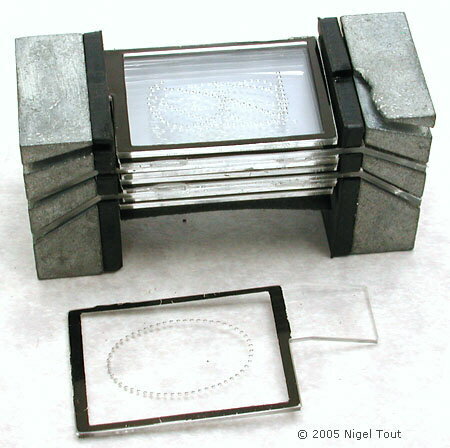 Here are photographs of a similar, though larger, "light-pipe" display module showing its contruction. The modules used in the Canon Canola 30S are of a more compact design but work in an identical way. The complete module with the display window through which the numbers are viewed. Removing the cover reveals the stack of plastic light-pipe sheets, one for each number 0 to 9 in this module. Decimal points sheets could also be fitted. Each sheet carries its number marked out in an array of conical pits in its surface. When a light is shone into the edge of the short side of a sheet the light is piped round the corner, as with fibre optics, and illuminates the pits and so the number is seen. The bottom of this version is removed to allow replacement of the tiny filament lamps. There is one lamp to illuminate each "light-pipe" sheet. The bottom has been replaced allowing the connections to each lamp to be seen. These "light-pipe" numerical display modules only require the low voltage drive of the filament lamps. But the lamps have the disadvantages of high power consumption (though not much of a problem in an AC-powered calculator), short operating life, and a slow response. They were not widely used.